Home/Competitions/Happy Birthday to My Blog and a Giveaway! Happy Birthday to My Blog and a Giveaway! Just a quick post to say that today, May 30th, marks the 1 year anniversary since I started this blog. To be honest it doesn't even feel like 5 minutes ago that I bought the domain, installed WordPress and wrote my first post after Roger beat Wawrinka in the 4th round of the French Open. There were quite a few reasons I started this up but I have to say that the biggest motivator to blog on tennis and Roger was when I stumbled on Ruans Federer Blog in early 2011. I really enjoyed his own personal insight into Rogers matches and the popular discussions he had in the comments of practically every post. Seeing that pushed me to start up my own so for that I have to thank him. I was actually pretty lucky when I started up the blog as it was only 5 days into it that I got to blog about Roger beating Djokovic in the French Open semi final. I got such a buzz after that epic match and even though that post has probably only been viewed about 50 times in total it's probably the most excited I've been when writing one to date. Without the people who read this blog I don't even think it'd be anywhere close to what it is today, so I'd just like to say a massive thanks to everyone that reads here regularly. Of course I want to say a special thanks to everyone who comments and creates lots of discussion as that makes blogging all the more fun for both me and everyone else who reads it. But I also know for a fact there are lots of people who read here that don't comment and I want you to know that you guys are just as important to me and to the future of this blog too. After all we are all here because we really enjoy tennis and in particular love the legend that is Roger Federer and that's what makes this blog what it is so thanks! Now usually when it's someones birthday they're the ones that receive presents but I've decided to buck the trend and do a little giveaway of my own. 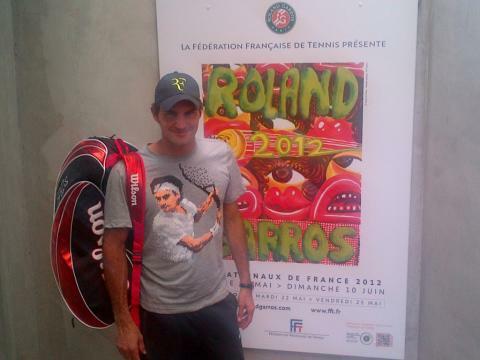 To celebrate the blogs first birthday I'm giving away a Fed pixel tshirt, as worn by the man himself in Paris just days ago. I first planned to make the competition where you had to leave a comment on why you were a Fed fan, but after a while I realised that wouldn't be a level playing field. After all, just because you can write eloquently doesn't mean your a better Federer fan than anyone else, I also know this blog has many global readers where English probably isn't their first language which again makes it unfair. I also thought about allowing only previous commenters to enter but as I pointed out above I know there are many people who read here regularly and don't comment yet still contribute massively to this blog so hopefully by keeping it straightforward it works out best for everyone. Alll you have to do enter is enter your email address in the box below and I'll draw a winner at random. Once a winner is announced I'll contact you on your email address, where you can let me know what size (S, M, L, XL or XXL) you want and I'll sort out postage and send you it. There's no long list of terms and conditions – it's just one tshirt, given to a winner drawn at random. Please only enter once and not with multiple email addresses. 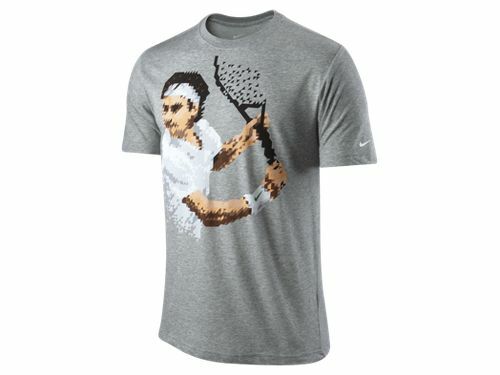 Also I'd like to think if you do enter that you are genuinely are Federer fan. Oh and it goes without saying the competition is open worldwide. Closing date for entry is Monday the 11th June, the day after the French Open finishes! N.B. Not open to anyone from MoneySavingExpert. Congratulations to the winner of the Fed Tshirt – Inba Kumar. I have emailed the winner and awaiting response! I also want to point out that by entering your email address above you're not signing up to anything and I'm not going to spam you out with updates. I can't guarantee that I won't email you from time to time if I happen to write an amazing article but rest assured your email address won't be sold or used for anything sinister. Well, that’s amazing. I’ve been reading this blog since Dubai, and I’m kinda in love with it. Everytime Roger plays a match I enter here, specially if I missed it. Thanks man, I’m glad you enjoy it. Will you try and see him play live? I will! I’m checking everyday for the ticket pre-sale. I’m so excited. I saved the money and I’ll try to get a nice seat. If you asked me last year, I wouldn’t believe that dream was going to come true. Thank you for making a great blog. Cool, it should be a good event. It’s good that Roger is finally playing over there as I know he has a lot of fans in that part of the world. Good luck with the tickets + seat! Kudos! I’ve only just found your blog last week but I’m already loving it. Here’s to the 2nd year (and a Grand Slam). Good luck if you entered the competition too. Yeah even 1 slam would be a good present! A day late but happy birthday! Lovely post, felt like I received personally as my birthday is today 31st. Really good to see the blog and the number of fans are growing and glowing. Congratulations. Congratulations man! Thousands peRFect wishesh for your blog! Hearty Congratulations to u man. Ur doing a terrific job. Hope u’ll continue ur great work.. Happy birthday to the Blog and keep up the good work! Jordan:) and im a huge Federer fan!can’t stop adoring him!!! I have entered your giveaway, I tried twice, but I have not received any confirmation email.. is that normal? Not sure why that would be, it might have gone to your junk email. It’s working my end. I’ve manually entered you onto the list though so don’t worry you’re in the draw! Your blog is wonderful for Fed groupies like me. I do hope RF plays for another five years and you will keep the blog going at least till he retires. FYI, I have all of Fed’s slam DVDs which I watch during the off-season! Haha cool I’m not a DVD man but I’m constantly youtubing videos! A Very Happy First Birthday Jonathan. I feel very lucky to have found your blog and look forward to the coming year. Love that you thanked Ruan, we are lucky for him too. With all that Roger is and has done there is nothing better then being a Federer Fan. Thanks Susan! Really glad you enjoy the blog. I know, the guy is a credit to the sport, best player in the history and also the best to watch too. Happy Birthday to this awesome blog! I remember I found it last year when I was searching for Roger’s new racquet images! Love the blog design and how easy it is to use!